These unique trains have long been called Thumpers due to the distinctive sound of their single on board diesel engines. Now, after the units' well earned retirement, this record of their unmistakeable sound (from trackside and on board) lives on in stereo. 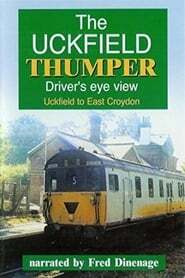 Surprisingly, the Uckfield branch is fascinating in itself. It is the stub of a former through route from Tunbridge Wells to Lewes. Nowadays the route features both single and double track sections. Following the fatal head on collision at Cowden in 1994, strict new operating procedures were put into place including the provision of SPAD signals at strategic points.